We are incredibly thankful for the generosity of Mike and Karel Helgeson who have stepped up to help launch the Great River Children’s Museum. The Helgeson’s donations have been extremely timely and impactful, enabling the board to sign off on work with consultants, architects and museum planners with confidence. The drawings provided by these professionals will help everyone rally together toward a purpose we can clearly see. Karel’s vision and faith in the people of Central Minnesota to join together in support of this museum are inspirational! Karel has been a member of the board since the summer of 2018. At the start of this year, she began functioning as secretary. Her creativity and experience working on the launch of GREAT Theater’s new Helgeson Learning Lab theater have been highly valuable. Karel recently arranged for the board and planning group to visit the Science Museum of Minnesota where her sister works in the exhibit building area. The experience of watching exhibits be created is another way that she has helped make the mission of the Great River Children’s Museum more tangible. Congratulations go out to Vincent and Cassie Miles on the birth of their baby boy, Desmond. He has been nominated to receive the first museum membership by several of our board members. Vincent, owner of Miles Psychological Services, joined the board of the Great River Children’s Museum in April of this year. His wife, Cassie, has served on the GREAT Theater board and he was looking for a way to give back to the community as well. When he heard about the children’s museum project, he was intrigued by the opportunity to get involved on the ground floor of such an exciting project. The idea of bringing a children’s museum to town that his own son would be able to enjoy only added to the appeal. Becky Coborn is one of the first people to join the children’s museum project. In 2013, she began working as a licensed parent educator in ECFE (Early Childhood Family Education) in Sauk Rapids-Rice School District. Her own children were grown and flown from the nest and she felt compelled to invest in the children of her community, their parents and families. She completed her master’s degree in Child and Family Studies from St. Cloud State University in 2016. For her thesis project, Becky researched the impact of children’s museums on parents in communities. She found that children’s museums help parents to better understand child development and how to encourage their child’s learning. Becky has a deep love for the St. Cloud area and a desire to see our community thrive. 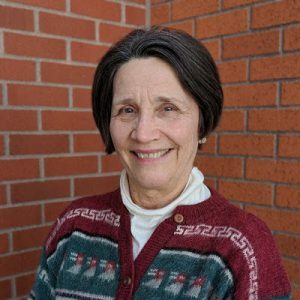 While raising her children, she served as a volunteer in many different capacities at Sacred Heart Elementary School, Cathedral High School, College of St. Benedict and St. John’s University. She strongly believes that building a children’s museum is the next best step for Central Minnesota. Becky understands that the early years are a crucial stage in a child’s growth and development. Having a place for families to come where kids can be free to play, explore and try new skills in a safe, rich learning environment will have long-term benefits to the entire community. She hopes to see parents connecting with their children through the museum experience and gaining knowledge about child development. When families grow stronger, communities grow stronger. We are doing something new in central Minnesota! Opening a children’s museum is a large and complicated feat. It was begun several years ago with the dream of Glen Palm. Glen retired in 2013 from his position as chair of the Child and Family Studies department at St. Cloud State University where he spent his career teaching parenting education, supervising students, and writing about parent education and fatherhood. He is a longtime early childhood advocate in the St. Cloud Area. He originally founded Super Saturdays for dads and young children in District 742, a program that continues today. If you hear Glen joke that he “just got out of prison,” it is because of his important work with incarcerated fathers at the Minnesota Correctional Facility in St. Cloud. Through a children’s museum, Glen sees a chance to fill a need in the community for a safe place for children and families to practice 21st century skills such as creativity, problem solving, teamwork and resilience in a playful atmosphere. He also sees it as a community project that will unify people from diverse backgrounds throughout the St. Cloud area. Upon his retirement from SCSU, he set about tackling early tasks such as gathering a small team of dedicated volunteers, establishing a non-profit organization, orchestrating community studies, and outlining a business plan. The location search has taken some time, but now appears to be nearing completion. With the finalization of a location will come a host of new challenges to be tackled. Glen and his growing team will approach each obstacle with the playful, creative spirit born in each of us in early childhood. The prospect of getting the whole community involved in creating a safe place for children to be children is exciting and energizing.